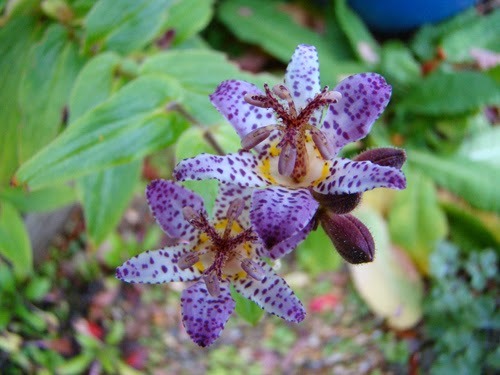 It was a set of mugs given to me by friends for a birthday that inspired us to plant a Toad Lily in the garden. The flowers are small but so exquisite especially against the red leaves of Autumn. They are so precise in the centre but goodness knows how I would create them in beads so I put it off and started with a red autumn leaf and a bud. 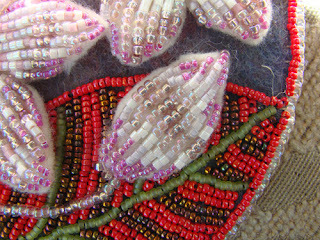 Next came the petals before finally trying to work out a way to bead the centre. 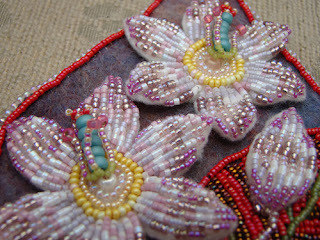 The flower in the middle has a tube which divides into three and around it six filaments and anthers so I made a tube of size 6 green beads with three clusters coming out of the top using size 15 beads and I used the same size beads to make striped filaments with a size 6 bead at the top. Not as pretty and exact as the flower but I quite like my quirky centres. 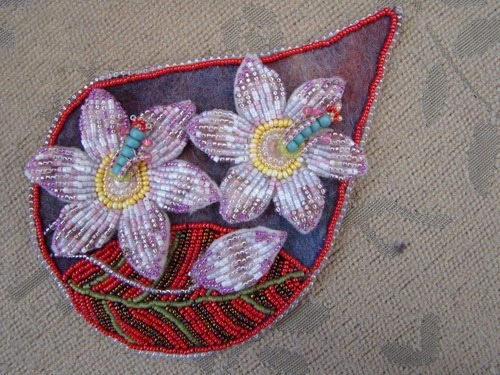 I wish I could have made the flowers more delicate or perhaps I should made the autumn leaf larger. So this is my October leaf capturing a bit of autumn colour and the Toad Lily in beads. What's all that complaining about "more delicate" etc.? I think your interpretation of the flower is fabulous. They turned out beautiful Evanna, I love what you have been doing this year. Great job! I think you did this to perfection, Evanna! You know what they are. Anybody who knew lilies would know what they are. 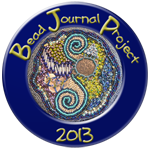 Exact, photo-accurate, beading can be a little boring sometimes... I love it that your beaded toad lilies and leaf suggest the beauty of the real thing, yet leave room for your beading to be beading. Does that make any sense? Hope so. Anyway, your work this year in the BJP is fantastic... congratulations... 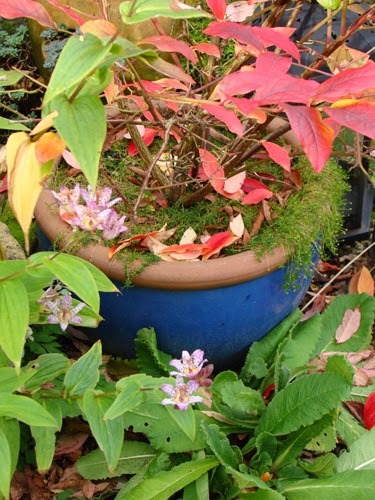 I look forward to seeing all the finished leaves together. What beautiful flowers...never heard of them before...and I love how you captured their essence!